✔Transfer distance :10M (the distance depends on the bluetooth device and environment). 1. Bluetooth Connection: You can enjoy your favourite music and movies from any bluetooth devices such as Smartphones, Tablets, Computers, Laptops and so on. Offers a wireless connection range of 10 meters (33 feet). 2. Wire Connection: Support AUX and RCA Modes. The speaker work with 3.5mm audio cable only, Before purchasing, PLEASE help to confirm that your TV or digital products do have 3.5mm AUX output or RCA output. If you have any question, please don't hesitate to contact us, we will respond to help in 24 hours! 3. WARRANTY: If You're not completely satisfied with Your Purchase Simply let us know and we'll offer a Full Refund or Replacement, with no questions asked! 4. 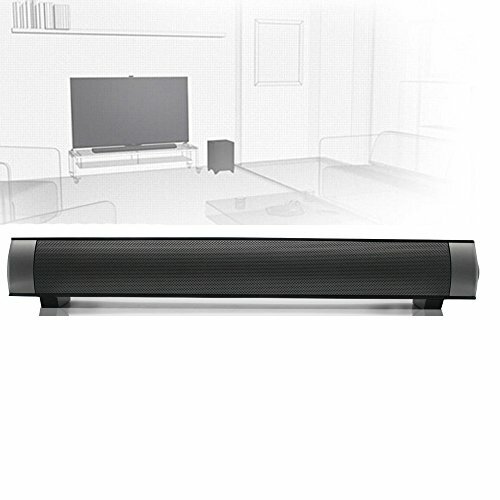 15.7INCH, 10W SMALL home speaker Soundbar system, Make you enjoy your favorite music in good quality sound. 5. Easy to use and Powered by built-in Rechargeable battery (charged by US Plug included).